With fall and the new school year just around the corner, chances are pretty good your upcoming plans include a shopping trip or two for new clothes. Before you go shopping, take a few minutes to figure out what and how much you really need. When you do you’ll save time and money. Here’s how to do it. Step 1. 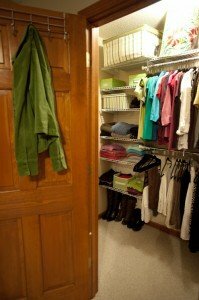 Pull fall and winter clothing out of storage. Then, go through them and weed out anything that no longer fits in terms of size, taste and lifestyle. Try things on and have your kids do the same, so you really know what works and what doesn’t. When you follow these simple steps before shopping, you’ll save money because you’ll avoid buying clothing you don’t really need. What’s more, fewer clothes means you’ll spend less time dealing with clothing and it will be easier to keep closets and dressers organized. This all adds up to more money, more time and less stress. That sounds like the perfect way to kick of the school year and fall season, don’t you think? Do you love back to school clothes shopping or dread it? Do you have any tips to share? I’d love to hear from you! So thankful for school uniforms here in Australia – ALL schools wear them…so there is still some shopping but just at one place (usually at the school itself) and with little decisions to make other than what sizes are needed !! Oh that does sound nice!